“Ah, such are the lures of the toilet that none will for long hold aloof from them. From: Max Beerbohm, A Defence of Cosmetics (1894). The condition of the hair plays an important role in our physical appearance and self-perception. The quantity, quality, and styling of our hair define our gender, age, health, and social status. There are no significant differences in the number of hair follicles between men and women, or between the different races. Differences in the appearance of hair are due to the type of hair produced by the follicle and the type of hair care practiced by the individual. Conventionally, the medical focus has been either on hair loss or the condition of the scalp in terms of specific dermatological conditions. In fact, the proximate structural arrangement of the scalp and hair leads to an interdependent relationship between the two. The protective benefits of the hair to the scalp, such as ultraviolet radiation (UVR) screening, moisture retention, and mechanical shielding, are obvious, while the role of the scalp as an incubatory environment for the preemergent hair fiber is often overlooked. It is the aim of this article to provide evidence that the condition of the scalp affects the natural growth and retention of hair, and consequently that appropriate scalp care may deliver fundamental benefits for hair growth and its quality. Preemergent hair can be negatively impacted by the oxidative stress that occurs with an unhealthy scalp, possibly due to the incubatory environment, specifically the metabolic activity of resident microbes. Therefore, hair care products with active agents that reduce the population of respective microbes and restore a healthy scalp while reducing the associated oxidative stress may have an impact on hair health. The specific anatomic features of the scalp skin, such as the large number of terminal hair follicles and the enlarged epidermal surface due to numerous hair canals, contribute to a specific microenvironment of the scalp and higher rate of exfoliation. Even a normal scalp will develop some degree of flaking within 1 or 2 weeks if the hair is not washed, while pathological dandruff results from accelerated proliferation of epidermal cells. This leads to a breakdown of the normal columnar structure of the stratum corneum with increased exfoliation of variously large collections of abnormally keratinizing epidermal cells and formation of cell aggregates, which determine the size of the flakes. The process results from focal inflammation of the scalp with parakeratosis which causes abnormal exfoliation and an altered light refractive index of the keratinized cell aggregates. The clinical appearance of dandruff is determined by the size, adherence, and light refractive characteristics of the flakes. Among the factors that lead to inflamed patches on the scalp are microbial colonization with Malassezia fungi, sebaceous lipids, and individual sensitivity. Seborrheic dermatitis represents a chronic recurrent condition characterized by scaling and poorly defined erythematous patches, with a predilection for areas rich in sebaceous glands. In contrast to dandruff, in seborrheic dermatitis, the redness and scaling frequently extend beyond the scalp to include the folds of the nose and eyebrow areas. The cause of seborrheic dermatitis is again understood to involve fungi of the genus Malassezia. Therefore, there seems to exist a pathogenic link with dandruff that is understood to represent the mildest form of the clinical presentation of seborrheic dermatitis. Psoriasis is a chronic inflammatory condition of the scalp, and the most thoroughly studied skin condition linking oxidative stress, the role of Malassezia spp., and risk of hair loss. In contrast to seborrheic dermatitis, the condition is characterized by sharply demarcated erythematosquamous lesions with silver-white scaling. The most dramatic expression of the immune-mediated condition is tumor necrosis factor-alpha inhibition – treatment-induced psoriasiform dermatitis of the scalp with the risk of permanent alopecia from scarring.,, Overgrowth of the scalp with Malassezia spp. is again a well-known feature of scalp psoriasis. Indicators of oxidative stress in psoriasis include altered antioxidant enzymes, oxidized proteins,, as well as oxidized lipids. Atopic dermatitis is yet another common, chronic, relapsing, inflammatory skin disorder that may affect the scalp in a significant manner. Its pathogenesis is complex and involves genetics, environmental factors, disrupted permeability of the skin, and immunologic mechanisms. A subset of patients with head-and-neck dermatitis may have a reaction to resident Malassezia flora exacerbating their condition.,,,,, This reaction is likely related to both humoral- and cell-mediated immunity. Even in the absence of differences in Malassezia spp. colonization, patients with head-and-neck atopic dermatitis are more likely to have positive skin prick test results and Malassezia-specific IgE compared to healthy controls and to patients with atopy without head-and-neck dermatitis. Again, atopic dermatitis is a condition that is strongly associated with oxidative stress: quantitation of urinary indicators of stress is elevated,,, as are oxidized surface protein levels, which in addition may be exacerbated by environmental impacts. Aging of the scalp underlies the same principles as aging of the skin, except for a natural protection from UVR depending on the amount of scalp hair. Aging represents the accumulation of changes over time, involving both programmed factors and damage-related factors (nonprogrammed factors). Programmed factors follow a biological timetable, perhaps a continuation of the one that regulates childhood growth and development. This regulation would depend on changes in gene expression that affect the systems responsible for maintenance, repair, and defense responses. Damage-related factors include internal and environmental assaults that induce cumulative damage at various levels. Aging of the hair itself affects hair color (graying), hair production (alopecia), and structural properties of the hair fiber (hair diameter, hair fiber curvature, stretching, bending, and torsional rigidity of the hair fiber, and lipid composition), with its consequence for the manageability and overall appearance of hair. In contrast, the aging effects on nonbalding scalp are relatively unnoticed. Underneath the hair, the scalp may appear pale and dry, with a certain degree of laxity. In contrast, balding scalp exhibits the features of photo-aged skin, including irregular pigmentation, wrinkling, atrophy, telangiectasia, and findings of cutaneous premalignant and malignant diseases, such as actinic keratosis, basal cell carcinoma, and squamous cell carcinoma. 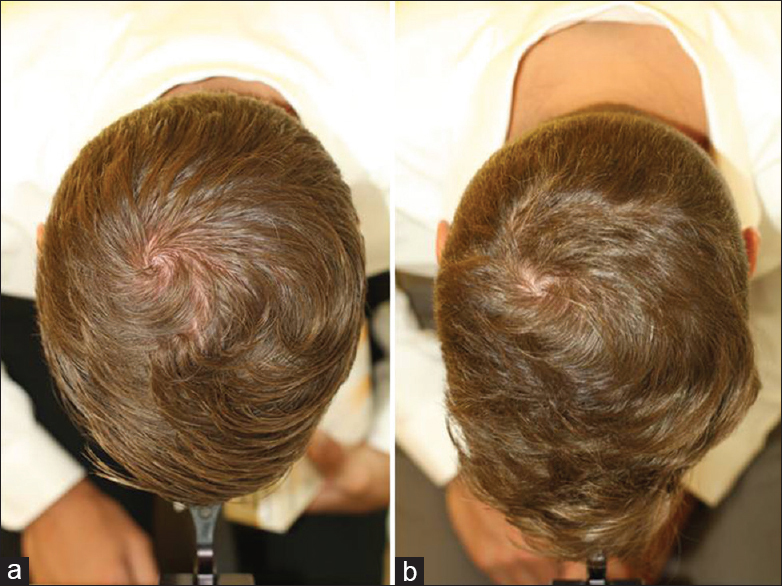 Onset of solar elastosis of the scalp precedes the onset of hair loss in androgenetic alopecia, providing the evidence that scalp hair does not completely protect from the effects of UVR and the need for added scalp UVR protection. Other aging features seen in the sun-damaged scalp include variability in thickness and cellularity in epidermis, unevenly distributed melanocytes, and increased inflammatory cells in the dermis. Due to the decrease in volume and elasticity, the skin becomes thinner and more easily damaged. Moreover, aging skin receives less blood flow and exhibits lower glandular activity. The net result of these effects is the decreasing ability of skin to heal itself, with an increase of skin pathologies. Remarkably, aging does not appear to follow a perfectly regular course over time. Periods of stability, or even partial remission, alternated with periods of more marked evolution, reflecting perhaps the influence of individual factors such as the individual's general health and nutritional status, life style and hygiene, and risk factors for accelerated aging. Experimental evidence supports the hypothesis that oxidative stress plays a major role in the aging process. In 1956, Harman originally proposed the free radical theory of aging. Free radicals are highly reactive molecules with unpaired electrons that can directly damage various cellular structural membranes, lipids, proteins, and DNA. The damaging effects of these reactive oxygen species are induced internally during normal metabolism and externally through exposure to various oxidative stresses from the environment. While the body possesses endogenous defense mechanisms, such as anti-oxidative enzymes (superoxide dismutase, catalase, and glutathione peroxidase) and nonenzymatic anti-oxidative molecules (Vitamin E, Vitamin C, glutathione, and ubiquinone), to protect it from free radicals by reducing and neutralizing them, with age, the production of free radicals increases, while the endogenous defense mechanisms decrease. This imbalance leads to the progressive damage of cellular structures, presumably resulting in the aging phenotype. Nishimura (oral communication, 7th World Congress for Hair Research, May 4–6, 2013, Edinburgh, Scotland) found hair follicles to age through defective renewal of hair follicle stem cells much in the manner as maintenance of melanocyte stem cells becomes incomplete with aging. Hair production and pigmentation is fueled by stem cells, which transition between cyclical bouts of rest and activity. Aged hair follicle stem cells exhibit enhanced resting and abbreviated growth phases and are delayed in response to tissue-regenerating cues. Ultimately, aged hair follicle stem cells are poor at initiating proliferation and show diminished self-renewing capacity upon extensive use. Aging-related loss of hair follicle stem cell marker expression starts well before hair follicles have shortened. Using genomic instability syndromes and exposure to ionizing radiation as models, Nishimura proposed an accumulation of DNA damage to be involved in the aging process. Conventionally, the study of hair aging has focused on two main streams of attention: on the one hand, the esthetic problem of aging hair and its management, in other words everything that happens outside the skin, and on the other hand, the biological problem of hair aging, in terms of microscopic, biochemical, and molecular changes within the follicle in the depth of the scalp. The condition of the hair fiber must be viewed as the result of a combination of preemergent and of postemergent factors. Sources of oxidative stress with impact on the preemergent fiber include oxidative metabolism; smoking;, UVR; inflammation from microbial, pollutant, or irritant origins; and oxidized scalp lipids. 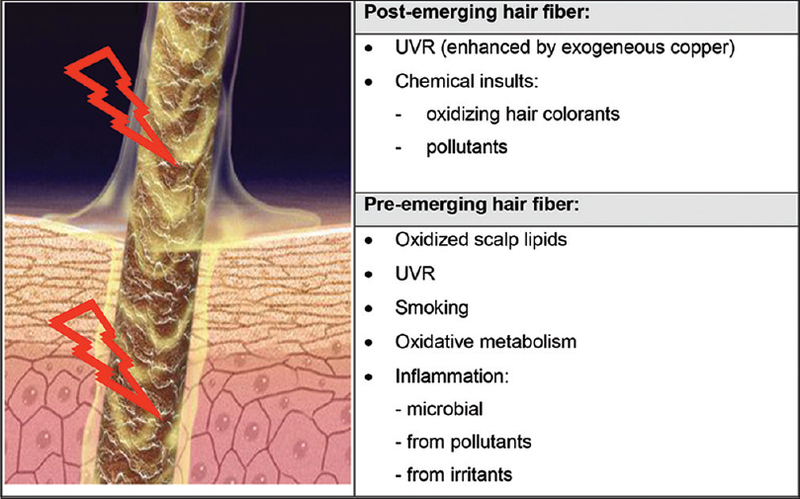 Sources of oxidative stress with impact on the postemergent fiber include again UVR, and chemical insults from oxidizing hair colorants and pollutants [Figure 1]. While age-dependent thinning of hair is understood to be genetically determined and linked to peculiarities of hormone metabolism, it is primarily treated with the respective hair growth-promoting agent minoxidil and the 5-alpha-reductase inhibitors finasteride or dutasteride. Nevertheless, their limited success rate means that further pathogenic pathways must be taken into account. Specifically, Bahta et al. originally demonstrated that cultured dermal papilla cells (DPCs) from balding scalp grow slower in vitro than nonbalding DPCs. Loss of proliferative capacity of balding DPCs was associated with changes in cell morphology, expression of senescence-associated markers, decreased expression of proliferating cell markers, and upregulation of markers of oxidative stress and DNA damage. The finding of premature senescence of balding DPCs in association with the expression of markers of oxidative stress and DNA damage suggests that balding DPCs are particularly sensitive to environmental stress. As one of the major triggers of senescence in vitro stems from oxidative stress, Upton et al. further investigated the effects of oxidative stress on balding and occipital scalp DPCs. Patient-matched DPCs from balding and occipital scalp were cultured at atmospheric (21%) or physiologically normal (2%) O2. At 21% O2, DPCs showed flattened morphology and a significant reduction in mobility, population doubling, increased levels of reactive oxygen species and senescence-associated β-Gal activity, and increased expression of p16 (INK4a) and pRB. Balding DPCs secreted higher levels of the negative hair growth regulators such as transforming growth factor beta 1 and 2 in response to H2O2 but not cell culture-associated oxidative stress. These in vitro findings suggest a role for oxidative stress in the pathogenesis of androgenetic alopecia both in relation to cell senescence and migration, and also to secretion of known hair follicle inhibitory factors. Finally, stress-induced premature senescence of DPCs compromise hair follicle epithelial–mesenchymal interaction underlying hair cycling. Studies have demonstrated oxidative stress associated with alopecia.,,,,, The measures are similar to those in other skin conditions: antioxidant enzymes, protein oxidation, and lipid oxidation. The most common manifestation of the oxidative stress is lipid oxidation, and therefore quantitation of lipid peroxidation is a particularly prevalent method in dermatologic research. The oxidized lipids are now understood to negatively influence the normal growth of hair: Naito et al. analyzed the effect of the lipid peroxides on hair follicles and observed that the topical application of linolein hydroperoxides, one of the lipid peroxides, leads to the early onset of the catagen phase in hair cycles. Furthermore, they found that lipid peroxides induced apoptosis of hair follicle cells. They also induced apoptosis in human epidermal keratinocytes by upregulating apoptosis-related genes. These results indicate that lipid peroxides, which can cause free radicals, induce the apoptosis of hair follicle cells, and this is followed by early onset of the catagen phase. 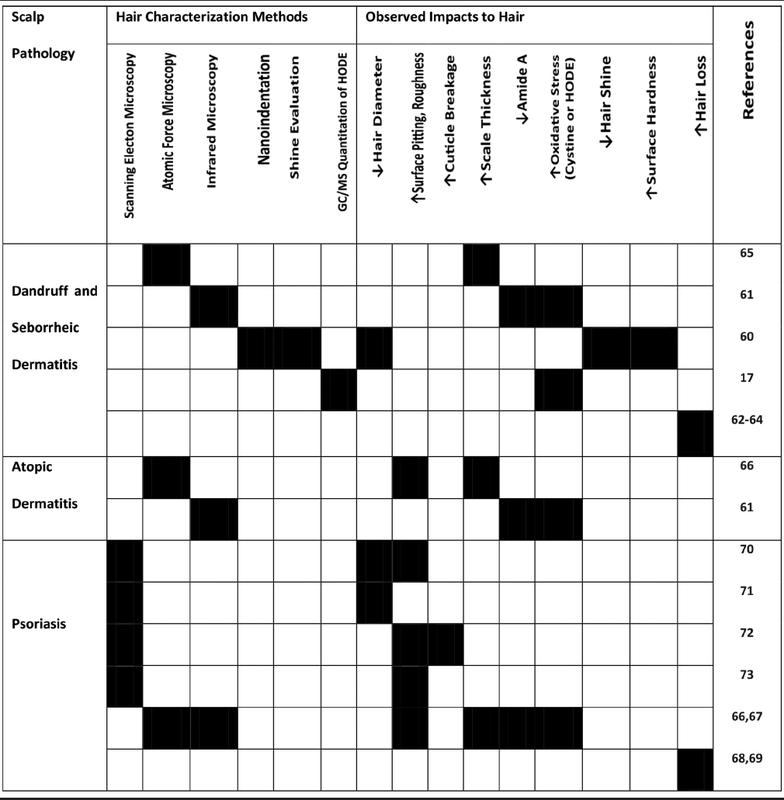 There is ample evidence from data involving collections and characterization of hair samples from various unhealthy scalp conditions to help establish a link between scalp health and hair growth and quality.,,,,,,,,,,,,,, Most of the published data are epidemiological in nature comparing hair obtained from individuals with dandruff or seborrheic dermatitis,,,,,,, atopic dermatitis,, and psoriasis,,,,,, with that from a control group of healthy scalp individuals. The results are summarized in [Table 1]. Finally, a number of observations have found that premature hair loss may be caused by the poor scalp health associated with either dandruff and seborrheic dermatitis,,, or psoriasis,, indicating that the effect on the preemergent hair fiber may alter the anchoring force of the fiber with the follicle, as evidenced by an increased proportion both of catagen and telogen,, and of dysplastic anagen hairs (anagen hairs devoid of hair root sheaths), in the trichogram (hair pluck). Until the introduction of the first nonalkaline shampoos in 1933, soap was the only available cleanser for the hair and scalp. Today, shampoos are expected to be more than mere cleansing agents. They are expected to improve the hair cosmetically while being tailored to the needs of various hair types, age, and scalp condition. Finally, with respect to product comfort, shampoos are expected to not dry out the hair, to produce lather in hard and soft water and, when applied to oily hair, to be nonirritating to skin and mucous membranes, to be chemically and physically stable, to be biodegradable, and affordable. Accordingly, shampoos have evolved into high-tech products consisting of ten to thirty ingredients that are combined in precise formulations to meet consumer demands. Ultimately, shampoo treatments are the most commonly used means of managing hair and scalp conditions and have proven to be effective for the treatment of dandruff and seborrheic dermatitis,,,,, psoriasis, and atopic dermatitis of the head-and-neck type., Today, it is understood that scalp care products for dandruff and seborrheic dermatitis, psoriasis, and atopic dermatitis exert their benefits by controlling scalp Malassezia levels. Given the observations on the role of oxidative stress in premature hair loss and the part that Malassezia spp. play in generating oxidative stress, it is likely that products with Malassezia control active would exert some hair loss prevention benefits. Originally, Piérard et al. hypothesized on a microbial-driven inflammatory reaction abutting on the hair follicles and performed a pilot study with twenty males using an 0.25% octopirox leave-on product and demonstrated that the product improved the semi-quantitative self-assessment of hair loss over a 1.5-year treatment period. Subsequently, Piérard-Franchimont et al. conducted a study to compare the effect of 2% ketoconazole shampoo to that of an unmedicated shampoo used in combination with or without 2% minoxidil therapy for male androgenetic alopecia and found that hair density and size and proportion of anagen follicles were improved almost similarly by both ketoconazole and minoxidil regimens, even in the absence of dandruff. The authors concluded that there may be a significant action of ketoconazole upon the course of androgenetic alopecia and that Malassezia spp. play a role in the inflammatory reaction. Following the original studies of Piérard et al. and Piérard-Franchimont et al.,, Berger et al. performed a 6-month, randomized, investigator-blinded, parallel-group clinical study to assess the hair growth benefits of a 1% zinc pyrithione (ZPT)-based shampoo (Head & Shoulders®, Procter and Gamble Company) in males between the ages of 18 and 49 years exhibiting Hamilton–Norwood type III vertex or type IV baldness. The efficacy of the 1% ZPT-based shampoo (used daily) was compared with that of 5% minoxidil topical solution (applied twice daily), a placebo shampoo, and a combination of the 1% ZPT-based shampoo and the 5% minoxidil topical solution. Hair count results showed a significant net increase in total visible hair counts for the 1% ZPT shampoo, the 5% minoxidil topical solution, and the combination treatment groups relative to the placebo shampoo after 9 weeks of treatment. Finally, a placebo-controlled treatment study with a ZPT-based shampoo (Head & Shoulders®) was published demonstrating decreased oxidative stress in both scalp and preemergent hair for the ZPT leg. This provides support for the underlying mechanisms for hair loss reduction observations for the ZPT-based shampoo as well as other Malassezia-inhibiting shampoo actives. The science of hair care not only addresses the esthetic problem of the condition of the hair fiber in terms of hair quality and color, but also the underlying biological problem of hair aging and pathologies. While the role of oxidative stress has been widely discussed in relation to the skin and aging, in comparison, little focus has been placed on its role in impacting scalp health, hair growth, and condition. There is a wealth of observational data on specific dermatological conditions, such as dandruff and seborrheic dermatitis, psoriasis, and atopic dermatitis, providing the evidence for the role of a healthy scalp in supporting the production of healthy hair. Oxidative stress, the inability of the body to sufficiently counteract sources of oxidative damage, is prevalent in all of these skin conditions, just as in normal skin aging. On the scalp, the hair appears to be impacted prior to emergence, and oxidative stress appears to play a role in premature hair loss. The scalp commensal organism, Malassezia, has been recognized to be a source of oxidative damage. Therefore, hair care products with active agents that reduce the population of Malassezia tend to reduce premature hair loss [Figure 2]. Since Malassezia is a source of oxidative stress, its presence, even in individuals not showing symptoms of scalp pathologies, likely enhances subclinical stress that could contribute to compromised hair quality and growth. Besides its known benefits in treating scalp pathologies, such as dandruff and seborrheic dermatitis, psoriasis, and atopic dermatitis of the scalp, a ZPT-based shampoo (Head & Shoulders) has demonstrated reduction in hair loss by several assessment methods, even in the absence of scalp pathologies. Considering the relationship between oxidative stress, Malassezia spp., and hair aging, it is therefore conceivable that regular use may contribute to hair loss prevention. R. M. Trüeb is an active member of the Healthy Hair and Scalp Alliance and in this function provides consulting activity for Procter and Gamble. J. R. Schwartz, M. G. Davis, and J. P. Henry are employees of Procter and Gamble. Parts of this article were orally presented by R. M. Trüeb on November 2nd 2017 on the occasion of the 10th World Congress of Hair Research Societies (WCHR) 2017 in Kyoto, Japan. Niki E. Lipid peroxidation: Physiological levels and dual biological effects. Free Radic Biol Med 2009;47:469-84. Niki E. Lipid oxidation in the skin. Free Radic Res 2015;49:827-34. Niki E, Yoshida Y, Saito Y, Noguchi N. Lipid peroxidation: Mechanisms, inhibition, and biological effects. Biochem Biophys Res Commun 2005;338:668-76. Ackerman AB, Kligman AM. Some observations on dandruff. J Soc Cosm Chem 1969;20:81-101. DeAngelis YM, Gemmer CM, Kaczvinsky JR, Kenneally DC, Schwartz JR, Dawson TL Jr., et al. Three etiologic facets of dandruff and seborrheic dermatitis: Malassezia fungi, sebaceous lipids, and individual sensitivity. J Investig Dermatol Symp Proc 2005;10:295-7. Xu Z, Wang Z, Yuan C, Liu X, Yang F, Wang T, et al. Dandruff is associated with the conjoined interactions between host and microorganisms. Sci Rep 2016;6:24877. Jourdain R, Moga A, Vingler P, El Rawadi C, Pouradier F, Souverain L, et al. Exploration of scalp surface lipids reveals squalene peroxide as a potential actor in dandruff condition. Arch Dermatol Res 2016;308:153-63. El Shabrawi-Caelen L, La Placa M, Vincenzi C, Haidn T, Muellegger R, Tosti A, et al. Adalimumab-induced psoriasis of the scalp with diffuse alopecia: A severe potentially irreversible cutaneous side effect of TNF-alpha blockers. Inflamm Bowel Dis 2010;16:182-3. Cullen G, Kroshinsky D, Cheifetz AS, Korzenik JR. Psoriasis associated with anti-tumour necrosis factor therapy in inflammatory bowel disease: A new series and a review of 120 cases from the literature. Aliment Pharmacol Ther 2011;34:1318-27. Osório F, Magro F, Lisboa C, Lopes S, Macedo G, Bettencourt H, et al. Anti-TNF-alpha induced psoriasiform eruptions with severe scalp involvement and alopecia: Report of five cases and review of the literature. Dermatology 2012;225:163-7. Gomez-Moyano E, Crespo-Erchiga V, Martínez-Pilar L, Godoy Diaz D, Martínez-García S, Lova Navarro M, et al. Do Malassezia species play a role in exacerbation of scalp psoriasis? J Mycol Med 2014;24:87-92. Waersted A, Hjorth N. Pityrosporum orbiculare – A pathogenic factor in atopic dermatitis of the face, scalp and neck? Acta Derm Venereol Suppl (Stockh) 1985;114:146-8. Kim TY, Jang IG, Park YM, Kim HO, Kim CW. Head and neck dermatitis: The role of Malassezia furfur, topical steroid use and environmental factors in its causation. Clin Exp Dermatol 1999;24:226-31. Bayrou O, Pecquet C, Flahault A, Artigou C, Abuaf N, Leynadier F, et al. Head and neck atopic dermatitis and Malassezia-furfur-specific IgE antibodies. Dermatology 2005;211:107-13. Schmid-Grendelmeier P, Scheynius A, Crameri R. The role of sensitization to Malassezia sympodialis in atopic eczema. Chem Immunol Allergy 2006;91:98-109. Darabi K, Hostetler SG, Bechtel MA, Zirwas M. The role of Malassezia in atopic dermatitis affecting the head and neck of adults. J Am Acad Dermatol 2009;60:125-36. Brodská P, Panzner P, Pizinger K, Schmid-Grendelmeier P. IgE-mediated sensitization to Malassezia in atopic dermatitis: More common in male patients and in head and neck type. Dermatitis 2014;25:120-6. Devos SA, van der Valk PG. The relevance of skin prick tests for Pityrosporum ovale in patients with head and neck dermatitis. Allergy 2000;55:1056-8. Piérard-Franchimont C, Uhoda I, Saint-Léger D, Piérard GE. Androgenetic alopecia and stress-induced premature senescence by cumulative ultraviolet light exposure. Exog Dermatol 2002;1:203-6. Bluhm AL, Weinstein J, Sousa JA. Free radicals in tobacco smoke. Nature 1971;229:500. Trüeb RM. Molecular mechanisms of androgenetic alopecia. Exp Gerontol 2002;37:981-90. Upton JH, Hannen RF, Bahta AW, Farjo N, Farjo B, Philpott MP, et al. Oxidative stress-associated senescence in dermal papilla cells of men with androgenetic alopecia. J Invest Dermatol 2015;135:1244-52. Huang WY, Huang YC, Huang KS, Chan CC, Chiu HY, Tsai RY, et al. Stress-induced premature senescence of dermal papilla cells compromises hair follicle epithelial-mesenchymal interaction. J Dermatol Sci 2017;86:114-22. Akar A, Arca E, Erbil H, Akay C, Sayal A, Gür AR, et al. Antioxidant enzymes and lipid peroxidation in the scalp of patients with alopecia areata. J Dermatol Sci 2002;29:85-90. Koca R, Armutcu F, Altinyazar C, Gürel A. Evaluation of lipid peroxidation, oxidant/antioxidant status, and serum nitric oxide levels in alopecia areata. Med Sci Monit 2005;11:CR296-299. Abdel Fattah NS, Ebrahim AA, El Okda ES. Lipid peroxidation/antioxidant activity in patients with alopecia areata. J Eur Acad Dermatol Venereol 2011;25:403-8. Bakry OA, Elshazly RM, Shoeib MA, Gooda A. Oxidative stress in alopecia areata: A case-control study. Am J Clin Dermatol 2014;15:57-64. Motor S, Ozturk S, Ozcan O, Gurpinar AB, Can Y, Yuksel R, et al. Evaluation of total antioxidant status, total oxidant status and oxidative stress index in patients with alopecia areata. Int J Clin Exp Med 2014;7:1089-93. Yenin JZ, Serarslan G, Yönden Z, Ulutaş KT. Investigation of oxidative stress in patients with alopecia areata and its relationship with disease severity, duration, recurrence and pattern. Clin Exp Dermatol 2015;40:617-21. Nazzaro-Porro M, Passi S, Picardo M, Mercantini R, Breathnach AS. Lipoxygenase activity of Pityrosporum in vitro and in vivo. J Invest Dermatol 1986;87:108-12. Später S, Hipler UC, Haustein UF, Nenoff P. Generation of reactive oxygen species in vitro by Malassezia yeasts. Hautarzt 2009;60:122-7. Urbano CC. 50 years of hair care development. Cosmet Toiletries 1995;110:85-104. Squire RA, Goode K. A randomised, single-blind, single-centre clinical trial to evaluate comparative clinical efficacy of shampoos containing ciclopirox olamine (1.5%) and salicylic acid (3%), or ketoconazole (2%, nizoral) for the treatment of dandruff/seborrhoeic dermatitis. J Dermatolog Treat 2002;13:51-60. Piérard-Franchimont C, Goffin V, Decroix J, Piérard GE. A multicenter randomized trial of ketoconazole 2% and zinc pyrithione 1% shampoos in severe dandruff and seborrheic dermatitis. Skin Pharmacol Appl Skin Physiol 2002;15:434-41. Schmidt-Rose T, Braren S, Fölster H, Hillemann T, Oltrogge B, Philipp P, et al. Efficacy of a piroctone olamine/climbazole shampoo in comparison with a zinc pyrithione shampoo in subjects with moderate to severe dandruff. Int J Cosmet Sci 2011;33:276-82. Schwartz JR, Bacon RA, Shah R, Mizoguchi H, Tosti A. Therapeutic efficacy of anti-dandruff shampoos: A randomized clinical trial comparing products based on potentiated zinc pyrithione and zinc pyrithione/climbazole. Int J Cosmet Sci 2013;35:381-7. Okokon EO, Verbeek JH, Ruotsalainen JH, Ojo OA, Bakhoya VN. Topical antifungals for seborrhoeic dermatitis. Cochrane Database Syst Rev 2015;5:CD008138. van de Kerkhof PC, Franssen ME. Psoriasis of the scalp. Diagnosis and management. Am J Clin Dermatol 2001;2:159-65. Broberg A, Faergemann J. Topical antimycotic treatment of atopic dermatitis in the head/neck area. A double-blind randomised study. Acta Derm Venereol 1995;75:46-9. Mayser P, Kupfer J, Nemetz D, Schäfer U, Nilles M, Hort W, et al. Treatment of head and neck dermatitis with ciclopiroxolamine cream – Results of a double-blind, placebo-controlled study. Skin Pharmacol Physiol 2006;19:153-8. Piérard GE, Piérard-Franchimont C, Nikkels-Tassoudji N. Improvement in the inflammatory aspect of androgenetic alopecia. A pilot study with an antimicrobial lotion. J Dermatol Treat 1996;7:153-7. Piérard-Franchimont C, De Doncker P, Cauwenbergh G, Piérard GE. Ketoconazole shampoo: Effect of long-term use in androgenic alopecia. Dermatology 1998;196:474-7. Berger RS, Fu JL, Smiles KA, Turner CB, Schnell BM, Werchowski KM, et al. The effects of minoxidil, 1% pyrithione zinc and a combination of both on hair density: A randomized controlled trial. Br J Dermatol 2003;149:354-62.